(from the Japanese) meaning "gentle/yielding/compliant art” a martial art and combat sport that focuses on grappling and especially ground fighting with the goal of gaining a dominant position and using joint-locks and chokeholds to force an opponent to submit. The system developed from a modified version of pre-World War II Judo including some techniques from Japanese Jujutsu and with a focus on ne-waza (ground technique). It promotes the principle that a smaller, weaker person using leverage and proper technique can successfully defend themselves against a bigger, stronger assailant. Jiu-Jitsu can be trained for self defense, sport grappling tournaments (gi and no-gi) and mixed martial arts (MMA) competition. Sparring (commonly referred to as 'rolling') and live drilling play a major role in training, and a premium is placed on performance, especially in competition. refers to sport-fighting using kicks and punches and sometimes throws and bows representing a certain martial art or can be practiced for general fitness, or as a full-contact sport. 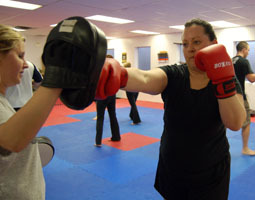 Kickboxing is sometimes practiced as an independent style however in many cases kickboxing is just an event and set of rules by which martial artists of other styles may compete openly. 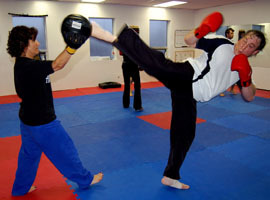 Typically kickboxing in many competitions is a standing fight sport and does not allow continuation of the fight once the fight has reached the ground. (MMA) is a combat sport in which a wide variety of fighting techniques are used, including striking and grappling. The term "Mixed martial arts" also refers to a martial arts style; see Hybrid martial arts. (called ne-waza "ground technique" in judo) refers to all the grappling techniques that are applied while the grapplers are no longer in a standing position. A large feature in most martial arts and combat sports featuring ground grappling, the goal is positioning and obtaining a dominant position. A dominant position (generally on top) generally puts the grappler in an advantageous position, he or she can use the position to escape by standing up, pinning and exhausting the opponent, executing a submission hold, or striking the opponent. The bottom grappler is, on the other hand, concerned with escaping the situation and improving his or her positioning, typically by using a sweep. In disciplines where the guard is used, the bottom grappler may be able to finish the fight from the bottom by a submission hold.